Hungry golfers found sustenance in the Los Feliz-based restaurant Knuckle & Claw, which was serving up made-to-order lobster roll sandwiches. GBK's 8th ANNUAL GEORGE LOPEZ CELEBRITY GOLF CLASSIC THANK YOU LOUNGE at Lakeside Golf Club in Burbank. 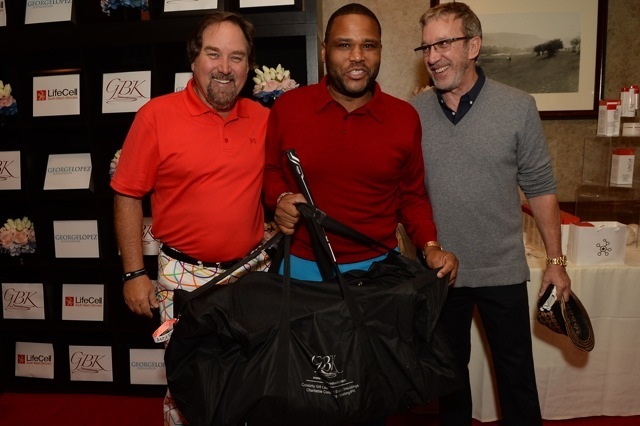 Golf took center stage at this event on Monday May 4th with Cleveland Gold giving out their TFI Smart Square putters while custom bag company Vessel Bags gifted custom bags to all the celebrities who participated in the Lopez' tournament. Additionally Curtis & Co. designed and created 200 limited edition watches from their CHALK line, which stands for Care, Happiness, Affection, Love and Kindness. Designer Matt Conable and his William Henry luxury brand had a collection of knives, money clips, bracelets and other accessories for men that incorporate such primal material as 100 million year old dinosaur bones and 10,000 year old fossil Wooly Mammoth teeth and fossil walrus tusks. There were iPhone and iPad cases from Pelican Gear made with shock absorbent liners and watertight seals to keep out rain and dust. LifeCell had its anti-aging skincare, while Milena's Boutique let guests choose from a variety of scented soy candles. 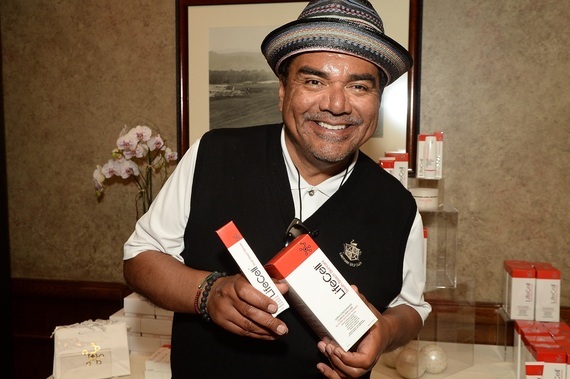 George Lopez with presenting sponsor LifeCell. Hungry golfers found sustenance in the Los Feliz-based restaurant Knuckle & Claw, which was serving up made-to-order lobster roll sandwiches. Sabra Dipping Company provided salsa and guacamole dips. Copa Di Vino (as seen on television's Shark Tank not once, but twice!) gifted wine bottled in single serve glasses. There was also D's Naturals powerbars, billed as the world's healthiest power bar because it has the highest concentration of plant protein ever put to a bar at 21 grams per bar. D's Naturals was also handing out jars of it's Vanilla Maple almond butter, the first plant based protein infused almond butter. If that wasn't impressive enough, Ohio-based company founder and CEO D Katz is only 18 years old! Other gifts included personal training sessions with Lalo Fuentes and a one-week VIP Club Pass to the Toluca Lake Tennis and Fitness Club. Caribbean Living Magazine handed out gift certificates for five day stays at Ce Blue Villas & Beach Resort in Anguilla. Coincidentally, travelers who have trouble clearing their ears while up in the sky picked up Eustachi, a drug-free devices that unplugs the ears anytime, anywhere.